Each onyx egg is unique. The photo shows the actual egg you will receive. Egg shaped stones project the energy of the stone in a universal and widely dispersed way, making it easier for one to access the energy of the stone. Egg shaped stones are an excellent aid to meditation and can be used to detect and rebalance energies in the body. The pointed end can also be used as a tool for reflexology or for applying acupressure. Onyx increases stamina and energy. It provides strength during times of enormous mental or physical exertion or when one is undergoing difficult or confusing situations. It enhances self-confidence and aids learning. It makes one more relaxed, sensitive, flexible and helps one to harmonise and balance levels of activity and rest. It is said to be beneficial to the liver, gallbladder, discs, joints, teeth, bones and feet. It aids healing of bone marrow and blood disorders. Onyx is useful when one wants to pursue creative projects and see thinks from a more expansive, "big picture" perspective. Onyx helps one to balance one's female side. BLACK focusses ones's energy in a refined manner. DARK BROWN focusses one's attention on issues related to the home. LIGHT BROWN helps one to remain physically balanced. WHITE promotes peace, purity and protection. It enhances understanding and freedom. ORANGE promotes personal power, increases self esteem, stimulates creativity, intellect and adaptability. GREEN attracts money, prosperity and wealth. Promotes growth, fertility, balance and change. GREY increases stability improves relationships and aids healing. 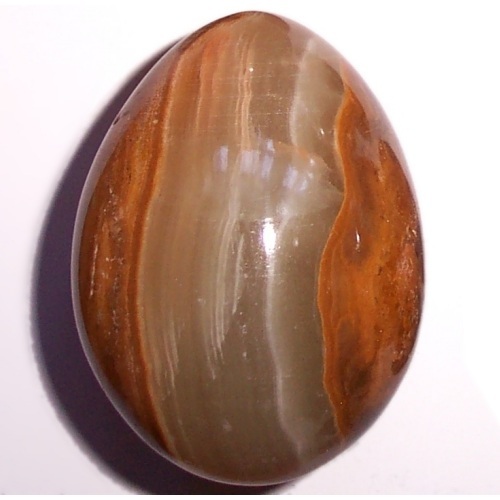 This beautiful Onyx Egg will be sent to you charged with beautiful healing Reiki energy.